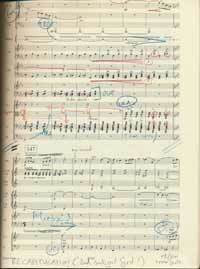 This page taken from Sun Valley Summer Symphony Music Director Alasdair Neale’s book of Mahler’s “Symphony No. 6 in A Minor” shows the complex scribblings and notes made by the conductor as he interprets how he will present the concert to audiences at the Sun Valley Pavilion on Tuesday, Aug. 7. Stringing together a cohesive yet broadly appealing summer symphony concert season is a bit like weaving together a history lesson without losing your audience. A good teacher brings the words to life with anecdotes, illustrative stories and perhaps a bit of dramatization. Much of the role of a music director is similar, and Sun Valley Summer Symphony's Alasdair Neale is one of those rare teachers who meticulously hammers out his roster for the intensive few weeks of summer when his favorite subjects are on the syllabus, giving him a chance to recruit or restore fans of orchestral music to the ranks. The free concert series officially got underway Monday night with the vocal prowess of soprano Deborah Voigt and the music of Wagner and Strauss. Before it is done on Tuesday, Aug. 14, listeners will have been on a journey filled with drama, heartache, color, reward, mirth and family. Concerts will feature classic, pop and a children's concert debut called "Cowboy Bill." Neale called his job a "very gradual but intense process of refinement and perfection." "I spend a lot of time sitting with the score in my lap imaging the music," he said. Next he plays it on the piano to memorize it and make the connections, "understanding the large-scale architecture of the piece [while] at the same time connecting the smaller phrases." He keeps track of the sentiments and interpretations with a series of notes and doodles on the score, dynamic reminders for the orchestra and cues for the players. "It's true that every second on the podium I'm making multiple decisions, sometimes on the spur of the moment," he said. "You have to be reactive to what's going on no matter what—could be a simple spontaneity, feeling a spark or responding to an emotional cue in the music that I had not anticipated and running with it and expecting the musicians to run with me." But at the center is one of the most anticipated works of the season, Mahler No. 6, which will be played Tuesday, Aug. 7. "This is an emotional and long work," symphony Executive Director Jennifer Teisinger said. "It is deliberately positioned. This is work that you want to see a summer festival doing and that this community has shown it has the interest in and the stamina for, and we have an orchestra that can perform it so beautifully that people should hear it." Mahler's great saying was that the symphony is the world, the symphony must embrace everything. "If we really understand all the joy in life, it has to be in the context of the other side," Neale said. "It's important to confirm the power of art to affirm everything in life, including the dark side." The performance placement is strategically in the middle, "when we've been rehearsing together as an ensemble for a while," he said. "It's enormously demanding, physically and mentally. It's like a complex jigsaw puzzle—everyone has to understand their piece and how it fits in with everybody else's." Neale said Mahler takes listeners on a journey through the human condition using a vocabulary rooted in universal musical gestures—the hymn tune, love song, nature sounds, cow bells. Each sound is immediately recognizable yet woven into a complex fabric of sound with skill and dexterity. "I've done a number of unusual and epic pieces before, all of which are significant, lengthy pieces," Neale said. "It's true that I'm upping the ante a bit ... but in the end, it's the journey that counts. Wednesday, Aug. 1, 6:30 p.m.: A tribute to symphony founder Carl Eberl with special guest Julianne Eberl on cello. With William VerMeulen, horn. Warren/Eberl "It Happened in Sun Valley;" Van Eechaute "Poème Nocturne for Horn;" Mozart "Concerto No. 3 for Horn in E-flat Major K. 447;" Elgar "Enigma Variations, Opus 36." Thursday, Aug. 2, 6:30 p.m.: Mendelssohn "Symphony No. 4 in A Major, Opus 90," "Italian"; Respighi "Pines of Rome." Friday, Aug. 3, 3 p.m. and 6:30 p.m.: Summer Music Workshops Concerts. Saturday, Aug. 4, 6:30 p.m.: Pops Night with Jeff Tyzik, conductor, Juliana Athayde, violin. Williams "Liberty Fanfare;"
arr. Tyzik "Fantasy on American Themes;" Copland "Hoedown from Rodeo;" O'Connor "Strings & Threads;" arr. Tyzik "Jelly Roll Morton Suite," Williams "The Patriot;" arr. Tyzik "Armed Forces Song Medley," Tyzik "A Call to Worship," Williams "Olympic Fanfare and Theme." Sunday, Aug. 5, 6:30 p.m.: On the Lighter Side with Jon Kimura Parker, piano. R. Strauss "Sunrise" from "Also Sprach Zarathustra;" Satie "Gymnopédie No. 2;" Mozart allegro from "Eine Kleine Nachtmusik, K. 525;" Gershwin "Summertime" from "Porgy and Bess;" Mendelssohn "Wedding March" from "A Midsummer Night's Dream, Opus 61"; Offenbach "Galop (Can-Can)" from "Orpheus in the Underworld;" Rachmaninoff "Rhapsody on a Theme of Paganini, Opus 43." Tuesday, Aug. 7, 6:30 p.m.: Mahler "Symphony No. 6 in A Minor." A longer program of approximately 90 minutes.